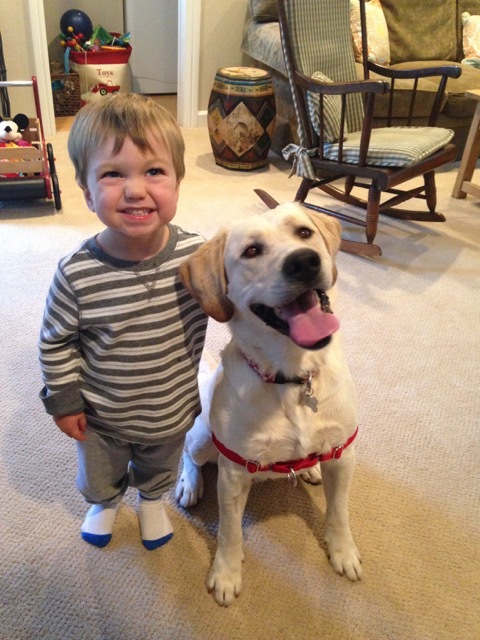 We love happy endings… or happy beginnings, as the case may be, when one of our rescue labs finds a wonderful new home!! Thought you might enjoy reading some of the notes we receive from the wonderful families who have adopted from us. 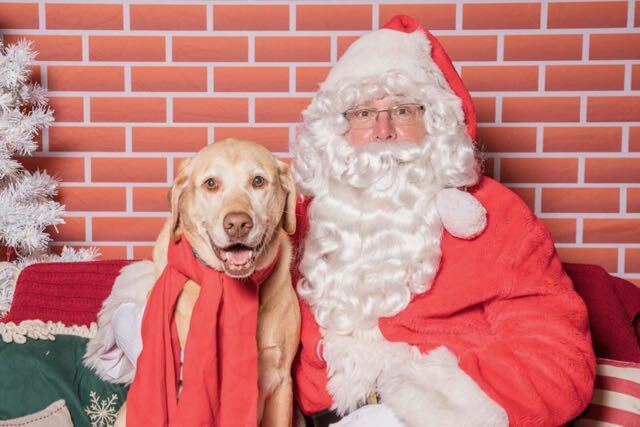 Labs are truly incredible which is what makes rescuing them so rewarding. They can suffer through abuse, being in shelters, being abandoned, and losing the only people they’ve ever known… and yet, given the chance to love again and be loved… they respond! They require a little patience, something our adopters seem to have in abundance. And they thrive…no matter how young or old they are. Gotta love ’em! We adopted Maverick in July when he was eight weeks old, and we continue to fall in love with him more each day. He’s doubled in size since we got him and is a gentle soul who just adores people. 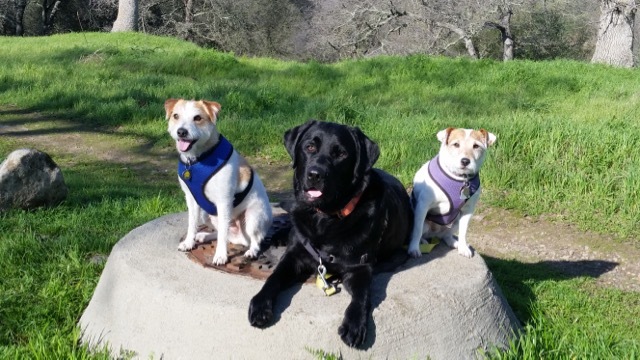 Maverick enjoys hanging with his pack on beach runs in Half Moon Bay, puppy manners class, and homemade dog food. He’s incredibly easy to train, loves kids – especially our one year old granddaughter – and simply makes our lives better. We just love our Maverick and feel so lucky to have him. 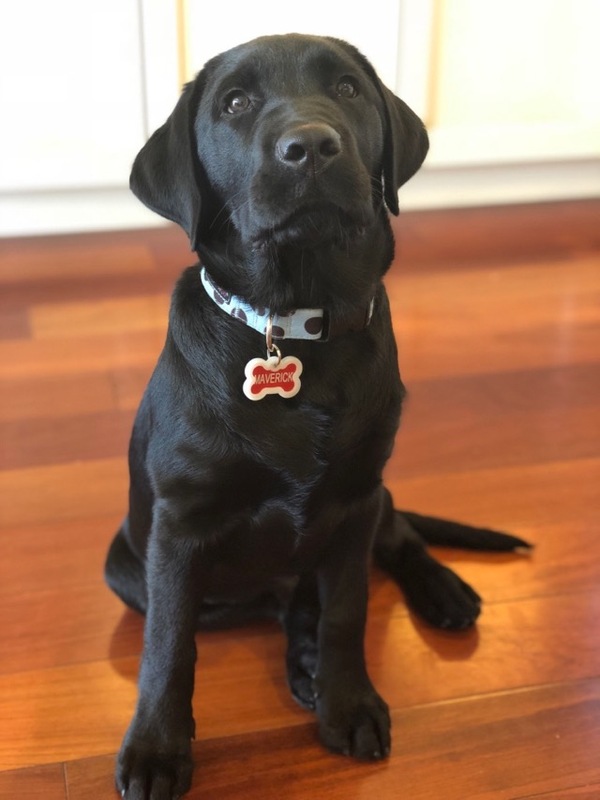 Thank you Monterey Bay Lab Rescue for pairing us with the perfect pup. I am completely in love with Ziggy. He is a sweet, funny and loving dog. After such a brief time, I noticed how much more relaxed and secure he is in his new home, and with Charlie and the other dogs on the property. 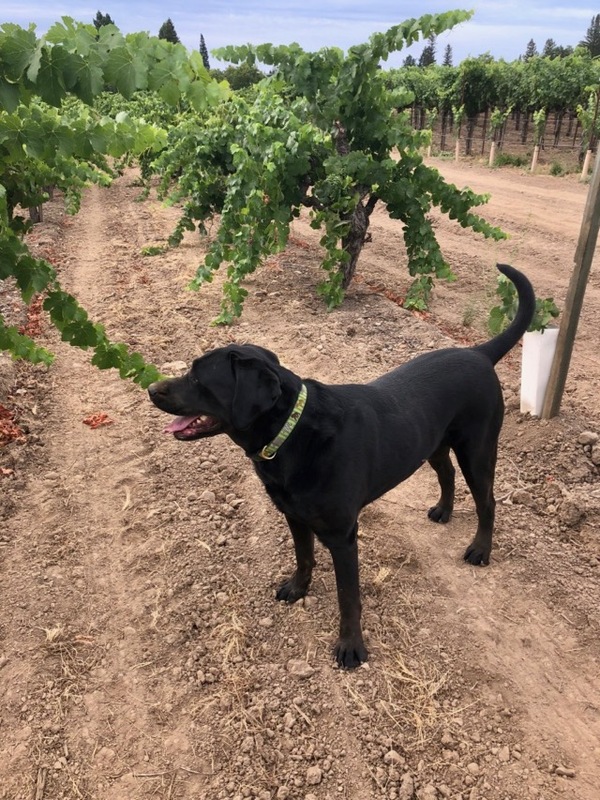 He has had many new adventures such as not leaving the side of the barbecue as a steak sizzles, running in the vineyards and sneaking a dip with Charlie in the town library’s fountain, and meeting lots of new friends hiking with me in Las Posadas. After wondering for a while if every time he got In my car I was going to take him back, he now jumps in easily and securely, and I can proudly say I cart around over 200 pounds of labs. There are a lot more adventures to come, but in the meantime, I assure him I am his new mama. Oh, and there are lots of remarks about how handsome he is. It is roasting up here right now, so Charlie, Ziggy and I are lounging in the air-conditioning. All three of us have been invited to a dinner party tonight, so Ziggy is resting up for his first cocktail! Ziggy is very well loved! Thank you! I hope you are well! I bet you are busy as always with your amazing lab rescue!! I haven’t sent an update or photo of our beautiful boy Leo in so long. I can’t believe he has been with us for 3.5 years. I love him with all my heart …he is absolutely the best. As I write, he’s laying on my legs on the bed snoring. He’s already had breakfast after which he likes to get on our bed and enjoy a post breakfast snooze. Leo and my little boy are best buddies. Leo is so gentle and tolerant. He’s our Gentle Giant. He has the perfect disposition. 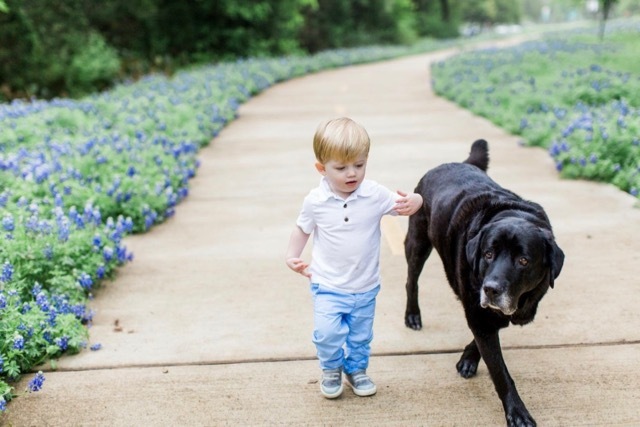 Here are a few photos of Leo and my little boy, John Henry, in the Texas Bluebonnets. Lucy and Henry are such a big part of our family, even after just 2 weeks. We love them very much. They have been to Netflix and met lots of friends at our house, at the park, and started their dog training classes this Saturday. They love going in the car with us on field trips and sunning themselves in the backyard and going on walks in the neighborhood. Take care and thanks again so much! After searching for some time she finally found us. That’s right ‘ HER ‘ people. Well the training has been ‘ ruff ‘ on the humans who find getting used to this much affection from a 1 yr. old overwhelming at times. Dallas is not stingy with kisses and loves the human touch. She has seven humans and two cats to oversee which accounts for the six hour nap in between. She never ceases to delight and make us laugh. You were saving this dog for a three generation family like ours. 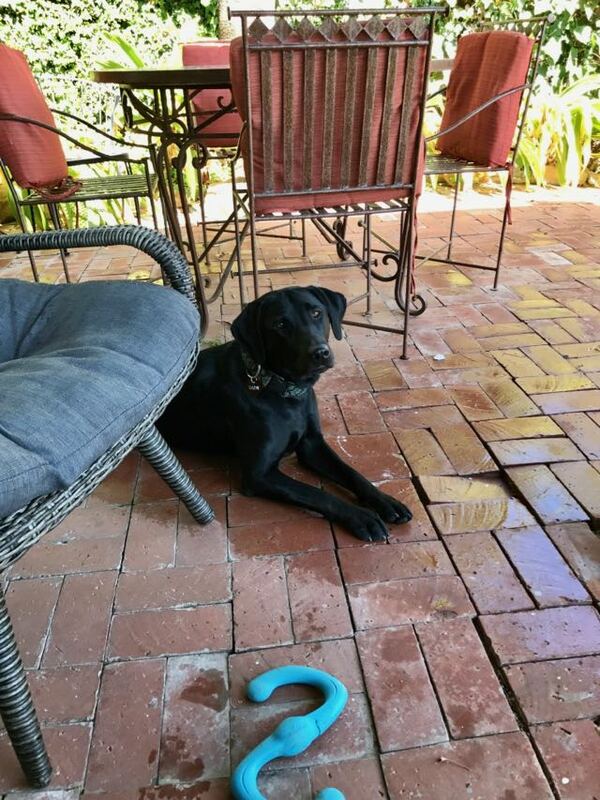 She is thrilled with everything, especially the kitties, very playful, gets lots of attention and room to play outdoors. She loves her sunbath and watching the geese swoop across open fields. Next adventure . . . the POOL ! Thank you Judy for teaming us up with Dallas, she is a perfect fit. Miss Dallas is in the palace ! We have to tell you, George has been the best gift. He is truly a joy. We take him everywhere with us. In November, we took a trip to Reno and found a very nice hotel that would allow us to take George. Needless to say, he was the hit of the hotel. The bell captain offered to take him out for walks at any time and everyone wanted to meet him while we all had dinner in the lounge. As we walked through the lobby when leaving, everyone was calling out to George, and they asked us to bring him back again soon. Herve’s kids all love. He attends Henri’s football and soccer games, although he doesn’t quite grasp the rules of the game. But the fans adore him and are always stopping by to say hi. His number one love is napping, although we’ve built his stamina up on walks as all three of us are working to lose some holiday weight. Thank you again for this amazing gift. It’s been over a year since we adopted Rory and Patti and I thought it would be fun to update you on her. First, she’s a delight and has been a wonderful addition to our family. 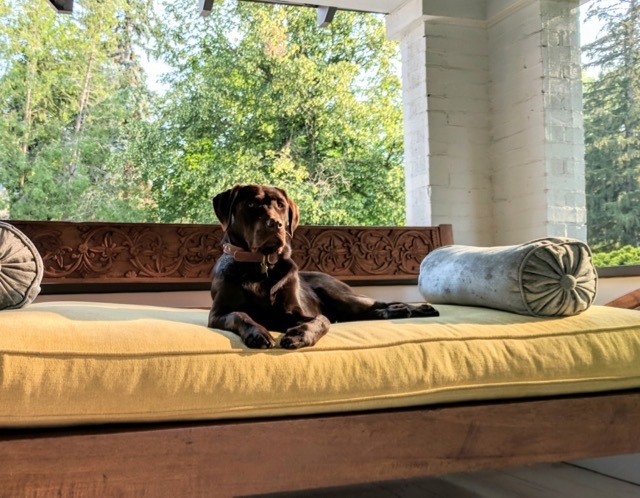 She was a tough grind early on and has taken a while to tone down her eagerness to chew most things, but we all love her and she loves us and her step-sister chocolate lab, 11 year old Tula. She has taken to touring the bedrooms at night, spending time sleeping on the floor of each of our three children’s rooms and ours as well. She’s always up for a cuddle which the kids in particular dish out daily. This past fall we relocated home to Ottawa, Canada and she’s been delighted by both the change of season and, more recently, snow! She loves bounding through deep snow and sprinting to greet other dogs who might be out on the trails as well. Everyone thinks she’s a wonderfully friendly girl. 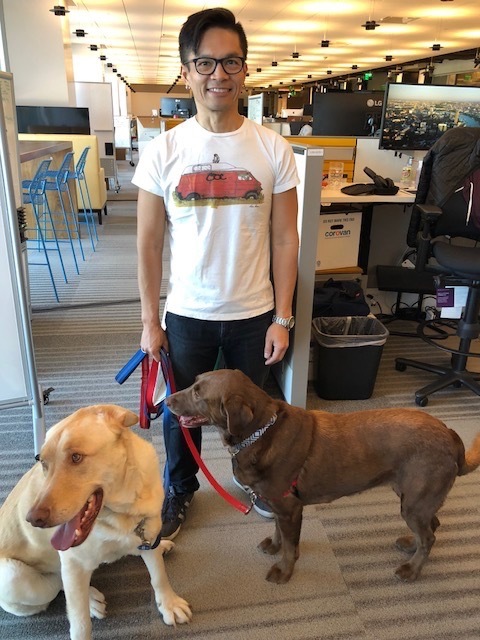 I hope your work finding homes for Labs continues to inspire you and bring you much joy! Thank you for all you are doing. I wanted to give a big plug for the many good things about adopting an older (and chubbier) dog. What you see is what you get – when you said that she didn’t have any bad habits and was really well-behaved, you were so right! Helping her lose weight has been good for us as well since we want to help her stay slim. And it’s so odd to say this about a lab, but we can actually leave food on the counter and it stays there – and this is a first for us! Please thank her wonderful foster family for us, and huge thanks to you for the wonderful work that you do. We can’t imagine life without her. 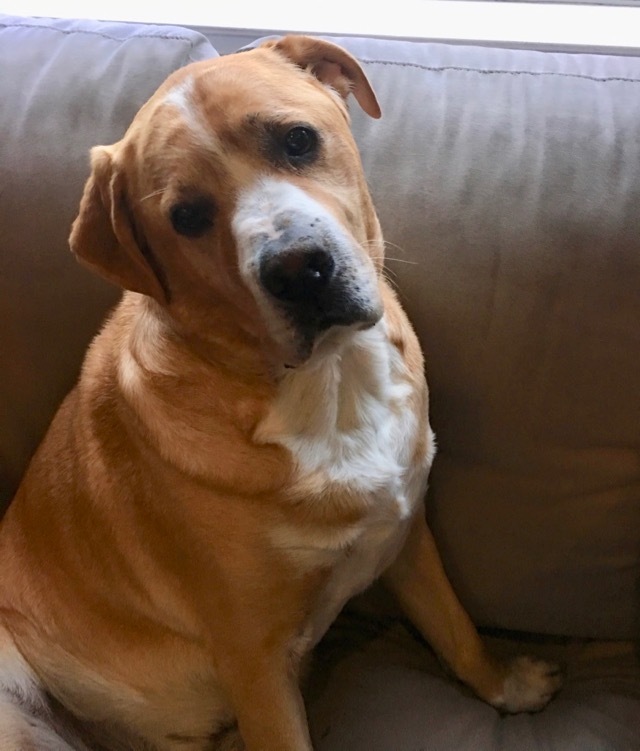 Toro is doing extremely well, he loves our daily walks here in Lafayette, chasing squirrels, barking at turkeys and cuddling – he thinks he is a lap dog. 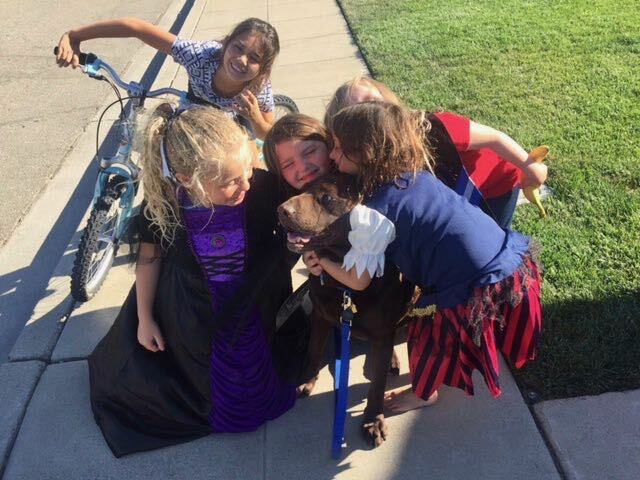 All the kids love him and all the neighbors tells us what a handsome boy he is! Just wanted to let you know Bear is doing sooooo well, he is a local celebrity as you can see. We are in line to go into several nursing homes and the VA in the area. He is so gentle I’m sure the people will love it! We couldn’t be happier with him; in fact we are taking a week long road trip up the coast soon. Everyday is an adventure with Tyson, and we are so happy he’s in our lives!! We are just loving sweet Sadie. She is such a beautiful little gem. She is so curious and ADORES Basil. We have been to the beach and breakwater several times but today was a very special day–today she had her first off leash day at Hendry’s Beach!!!! WOW!!!! She LOVED IT!!!!! Disneyland for her!!! Take good care and thank you forever and ever!!! It’s been one year since we adopted Lady. She is the best dog ever and we love her dearly. 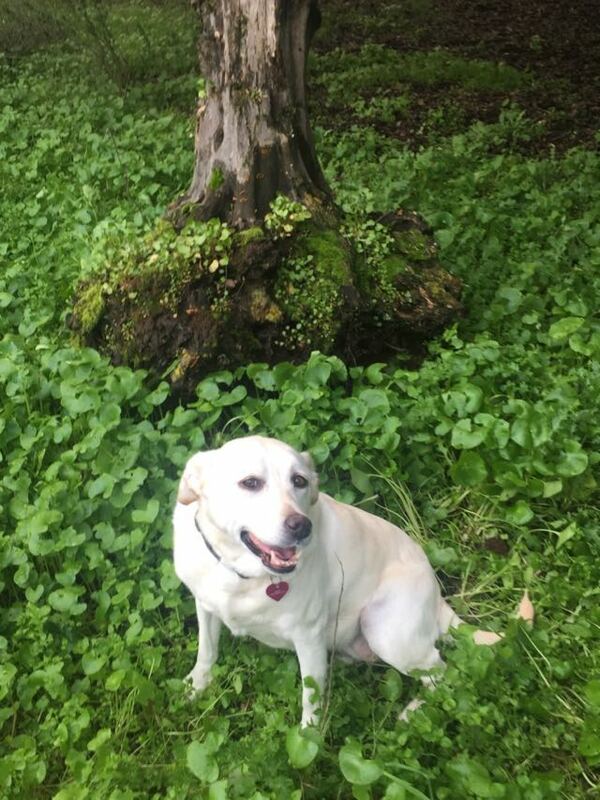 She enjoys our long hikes up here in Tahoe and in the Bay Area, and loves stalking the ground squirrels on our property. Everyone says what a beautiful dog she is. We couldn’t be happier and we think she’s very happy too. Gracie is doing great! 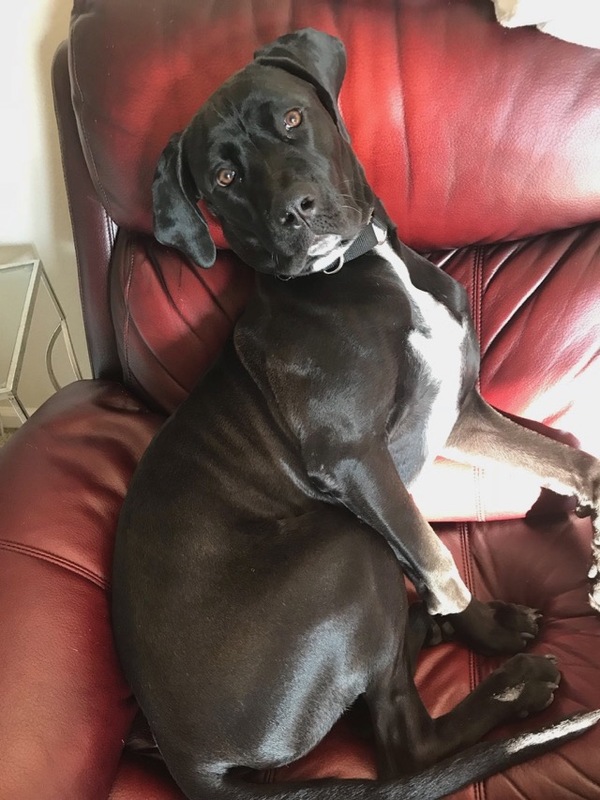 She is the darling of our community with people begging to walk and dog-sit her. She and I run a few miles twice a week and she has lost that little pot belly she had when we got her. She also walks with us in the beautiful East Foothills of San Jose where she chases deer, wild turkeys, quail and bunny rabbits, and we use a ‘bear bell’ to scare off the wild pigs. Gracie loves to sniff around the horses at the stable near here – she seems to think they are enormous dogs! She is in perfect health and in great shape for a 10 year old! 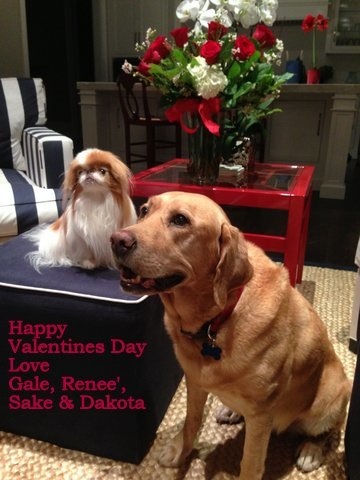 Thanks again for all the great work you do and for bringing Gracie into our lives. A true blessing. It has been four wonderful weeks since we brought Nike home. We feel so lucky to have found him! 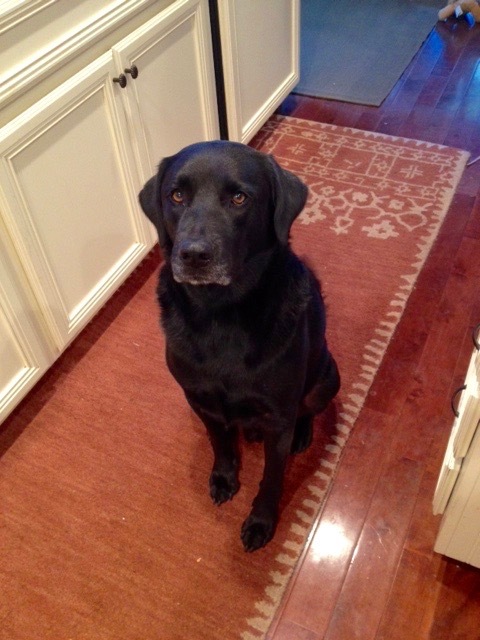 He is a well-mannered, gentle, affectionate, and all-around sweet 7-year old lab. He’s settling into his new environment beautifully. 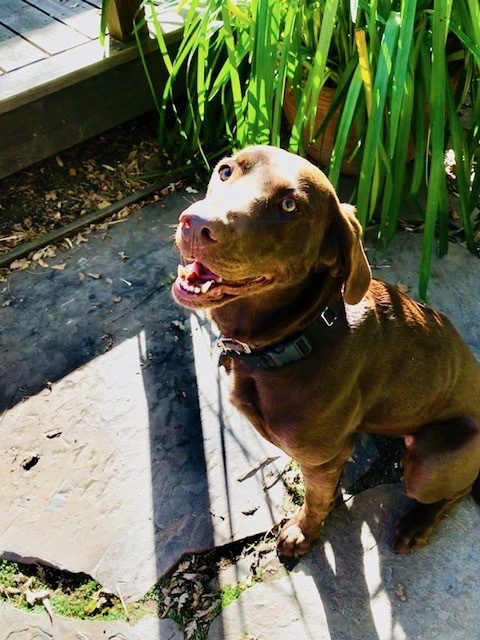 He happily and gently greets our neighbors and their dogs and loves going out on any adventure — especially if it involves getting in the water. Thanks again for everything you and your foster families do for these wonderful dogs. The whole process went so smoothly: from the detailed website description, to your thorough interview, to the foster dad’s interim care and hand-over, and his (and your) availability for follow-up questions. We are smitten with our Nike and he seems to be very happy. Our niece adores him. They are very patient, gentle, and sweet with each other. She likes to put flowers on him. As always, thank you for MBLRR. 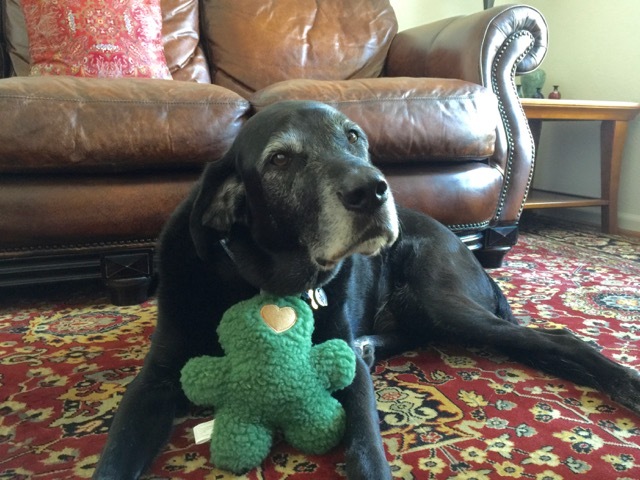 My husband and I lost our 16 yr old black Lab, Jesse about a year ago and we were missing a Lab in our lives. We have two Jack Russell Terriers, but we longed for a Lab too. 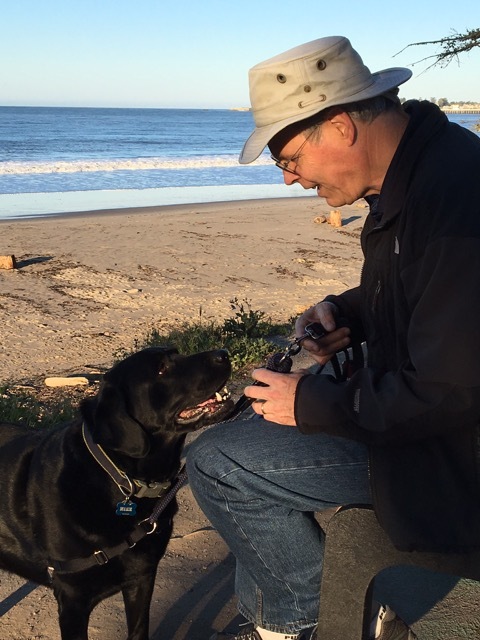 We have been following the Monterey Bay Labrador Retriever Facebook page for a while. When Angus “Gus” appeared we knew we needed him and contacted MBLRR to inquire about him. Gus is such a good boy and he has totally won over his JRT sisters. He enjoys long hikes every morning with other dog buddies and loves life on our farm. 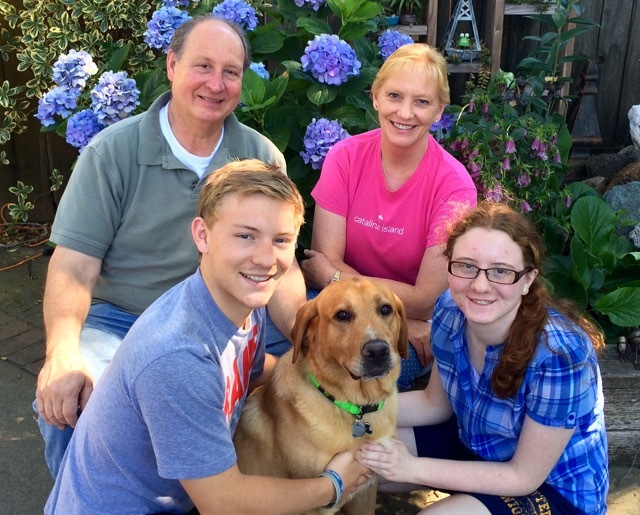 Thank you Monterey Bay Labrador Retriever Rescue. We couldn’t be happier with him! I hope you had a nice holiday and that you’re doing well placing so many wonderful pups! 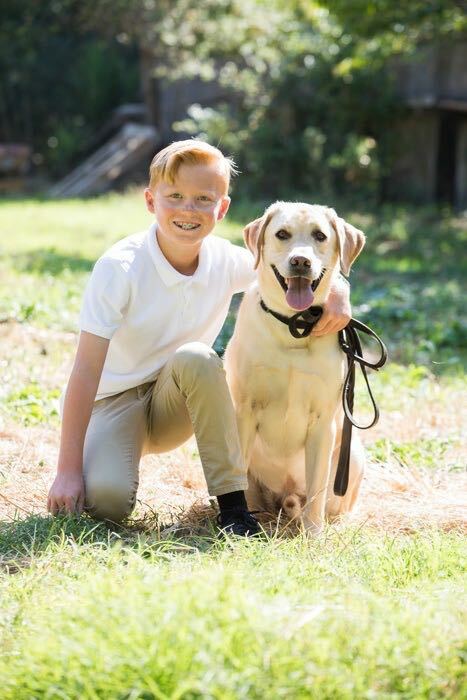 I want you know that Lightning has been such an incredible member of our family – he is doing great and very strong now! When we first got him last January, he couldnt jump into my truck and needed a ramp, now he hops right in and is ready to go whenever I am! 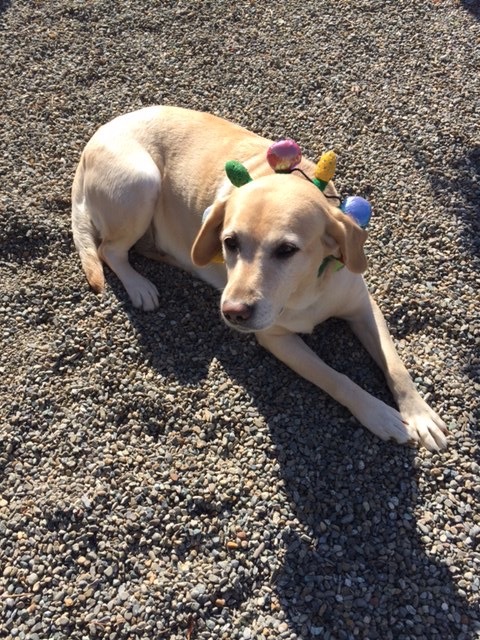 He spends every day at the winery with me and just loves meeting new customers and their kids and dogs too. He fetches his orange bumper several times a day and takes it pretty much everywhere with him. I just say “Go Get Your Toy” and he searches for it and usually finds it within a few minute after sniffing all around the yard. He has 30 acres to roam on but usually stays very close by. We just love him and couldn’t imagine life without his adorable presence. Thank you again for all you and your organization do! 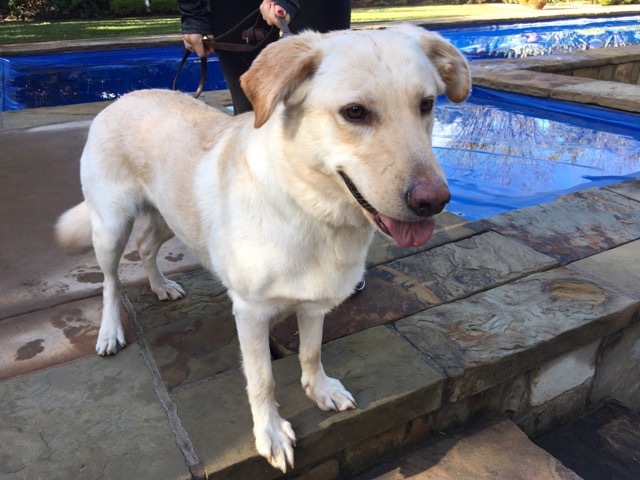 I wanted to tell you what a wonderful dog Annie (formerly Kelly) is and just how fortunate we feel to have found her – thanks to you! From the day we brought her home, it seemed like she’d always been part of our family and our daily routine. From that moment on, she captured our hearts and helped heal the loss of our 14-year old Molly. She has the perfect temperament—smart, funny, energetic, and loveable–so loveable that, at times, we feel overwhelmed at the affection. Not a bad thing, mind you! So, thank you for all that you do. Wishing you a Merry Christmas! We absolutely love Cooper. We’re really getting to know each other and how to work with each other. He’s a gentle, loving, energetic member of our family now. He’s great with my daughter’s little rescue terrier and also with our 2 year old grandson. He has brought so much joy back into our lives! Other than the pulling on the leash, which we’re working on, I think he’s absolutely perfect! He’s also very handsome. I call him my beautiful boy! I was hoping the right dog would come into our lives when it was meant to be. Cooper was definitely meant to be with us. We are so fortunate to have him. Thank you Judy for trusting our family with this precious being. leo is a joy – his manners, his enthusiasm! during his walks, new sights like the garbage truck are scary on first view, but on second view he sits and watches. Here is a picture of Lacey enjoying her triple cheeseburger on her staycation. She is such a good dog. When I gave her the triple cheeseburger she couldn’t believe it was for her and she set it on the ground and looked at me. I quickly went and got my camera and told her to get her burger. 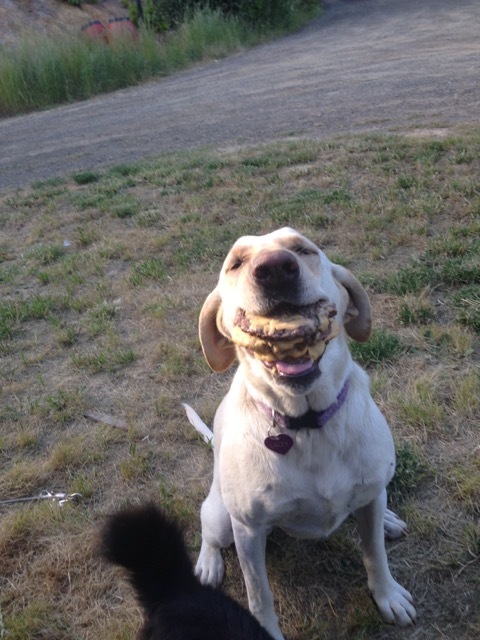 She picked it up and gave me this huge grin. For those of you concerned about her eating habits, fear not, she rarely eats people food and is extremely fit. She spends most of her “work” days chasing my husband up and down our steep 40 acres. 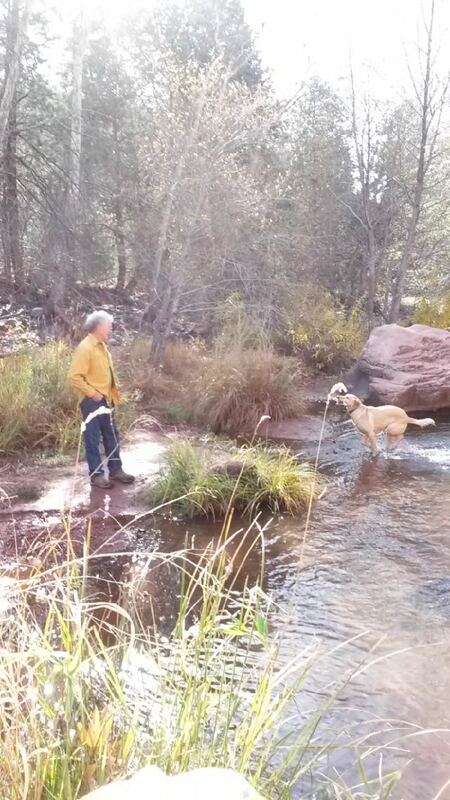 On her “free” time she runs next to him while he mountain bikes. They sometimes go as much as 24 miles. She loves it and yes, she earns her triple cheeseburgers. When she’s not chasing him around she spends her time lying around belly up. I love our rescue dog and can’t believe we got such a good dog! We just wanted to thank you again for placing Deacon with us. He has adapted beautifully. He enjoys his walks with me and runs with my husband and he is happy to leap in the car at every opportunity. On the whole he is a very happy lab who just wants to be wherever we are. He wags his tail often and hard. It’s been a while since I’ve sent updates on Jack. He is doing very well and we have all come a long way. He has made so many 2 and 4 legged friends who enjoy his company. 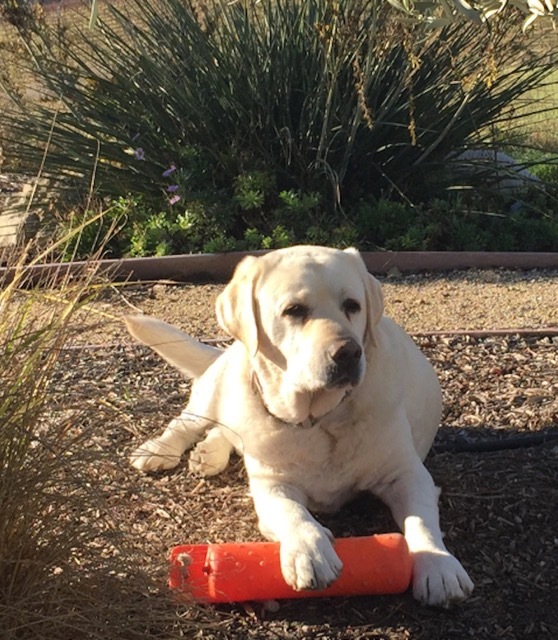 His favorite activities are eating, retrieving the ball, swimming and going everywhere we go including hiking and biking. 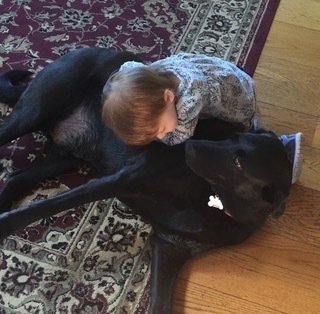 Grandma spoils him when he stays with her and there is certainly no shortage of love. He also loves Tahoe as did our beloved Coby and we are getting ready to go for another week of play. He has gained almost 10 pounds and his coat is so creamy white. He is a beautiful boy and receives compliments all the time. 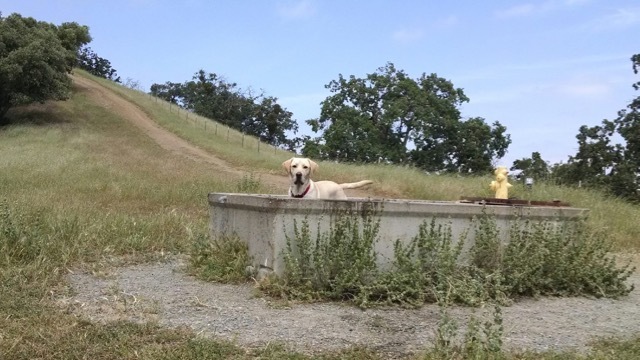 The cow’s trough is his favorite dipping place when we hike the Pleasanton ridge. He know when we pass through the gate and climb the last 2 hills we’re almost at the top and he starts running and jumps in. He waits for me here. Thought we’d share that photo with you. Thank you for entrusting his care to us. We love this guy and can’t imagine being without him. We love Bronson! He is the perfect dog and the perfect dog for us! He is learning to stay, learning his name, and learning how to take treats easily. He has been a total gentleman since we got him! Thanks a million for bringing him to us! Just thought I’d let you know how Nala is doing. Firstly, we renamed her Marley and she is doing great. 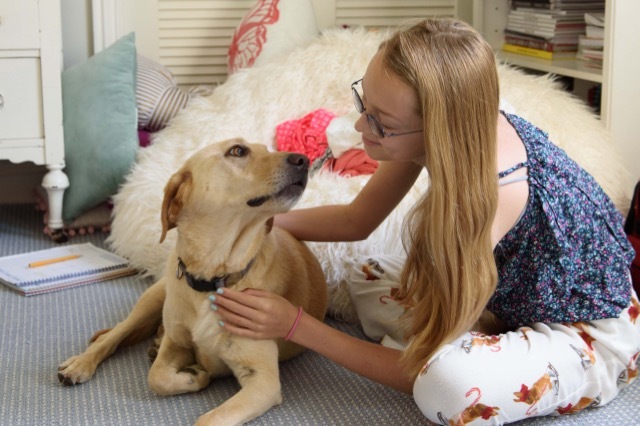 She is just a darling and I think she is the ideal dog for us… super affectionate and very well behaved. We have found a nice park nearby where lots of dog owners go in the morning and let the dogs off leash. 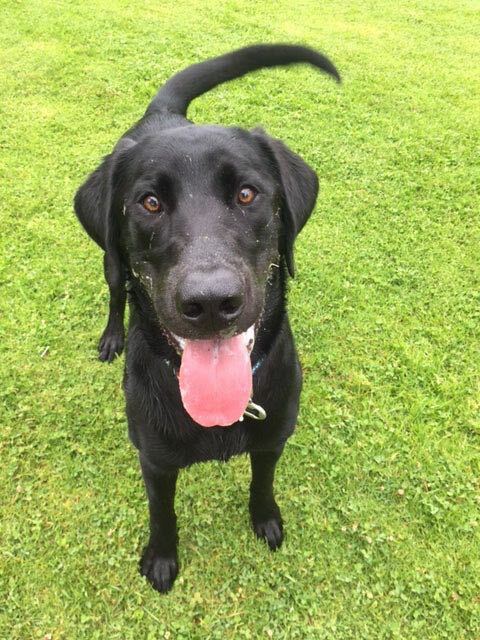 Marley just loves it – we throw the ball for her and she loves chasing after it and competing with the other dogs to get to the ball first, which she usually does. It is also nice that she has other dogs to socialize with, and she has definitely made some friends, two of whom are labs. As you might expect, Sarah loves having Marley as do we. I am attaching a photo of Marley and Sarah. Dakota is doing really well. We could not ask for a better fit; we are just loving her as the newest member of our family; Sake too… “ no issues” just sisterly love. Dakota is loving our neighborhood; making friends and loving big long walks; playing ball is her passion. All of our guys that work for us just love her. She is now the new favorite member of teem Sausalito Construction Inc.